Experts predict that by 2020, around 1.7 megabytes of new information will be created every second for every human being on the planet. Moreover, in mere five years, the number of smart connected devices in the world will amount to more than 50 billion – all of which will produce data that can be collected and analyzed. What does this mean, exactly? Essentially, this means that we are living in a world rich with data, and for businesses looking to streamline their processes, monitor various areas of performance, and understand their customer base on a deeper level, collecting, analyzing, and leveraging this wealth of insights is critical for success. But with so much data available from an ever-growing range of sources, how do you make sense of this information – and how do you extract value from it? One of the most effective means of doing this is KPI reporting. Looking for a bite-sized introduction to KPI reporting? Get our free guide! A straight definition of KPIs – or Key Performance Indicators – defines them as a value measured to assess how effective a project or a company is at achieving its business objectives. In other words, they provide organizations with the means of measuring how various aspects of the business are performing in relation to their strategic goals. On a fundamental level, KPIs provide critical performance-based information that enables an organization, and its stakeholders, to understand whether or not it’s on track and thus take action accordingly. A KPI report is a medium for measuring, organizing, and studying your most important business KPIs over specific time frames to help you spot potential strengths, weaknesses, trends, and possible areas for growth and improvement. Usually presented in the form of a digital dashboard, a KPI report provides a visual representation of the data associated with your predetermined set of key performance indicators. A KPI dashboard presents critical insights in a logical, digestible format that makes it easy to extract important information and act upon it retrospectively and in real-time. Fundamentally, a KPI report is a strategic tracking method that will provide a window to your business’s most essential activities. Why Are KPI Reports Important? As mentioned, we are living in a data-driven world and to win on today’s commercial battlefield, making informed decisions based on digital insights is a must if you want to thrive long into the future. KPI reports are important as they empower businesses to set meaningful goals and benchmarks, the kind of which that will help them improve, evolve, scale, and become more adaptable in an ever-changing digital landscape. By setting and measuring KPIs and customizing them through a KPI report, you will gain a wealth of insights into your business, from customer behaviors to financial inefficiencies and content performance. All of these elements, when organized in intuitive and visual KPI reporting dashboards, will not only allow you to spot patterns as they unfold but drill down into historical data and make the strategic tweaks and changes that can ultimately make or break your business. Every business, depending on its size, sector, and core objectives will have its own set of KPIs dedicated to different disciplines within the organization. To understand which KPIs will prove to be the most valuable to your business, you should sit down with key stakeholders and discuss your business aims, goals, and objectives in an open collaborative environment. You can find different lists of KPI examples classified according to their function and industry, which helps in narrowing down and pick the most critical ones you need. You can also take a look at our guide to KPI management and learn from some helpful best practices! Once you have decided which KPIs you’d like to work with, you will be able to set up a KPI report to start gathering, organizing, and analyzing your data. The most effective way to collate and manage your performance indicator is through a KPI software, as it will allow you to create comprehensive summary reports from various metrics and visualize them through powerful dashboards. And of all the available data visualization mediums, the dashboard is the most effective, efficient, and easy to navigate format. 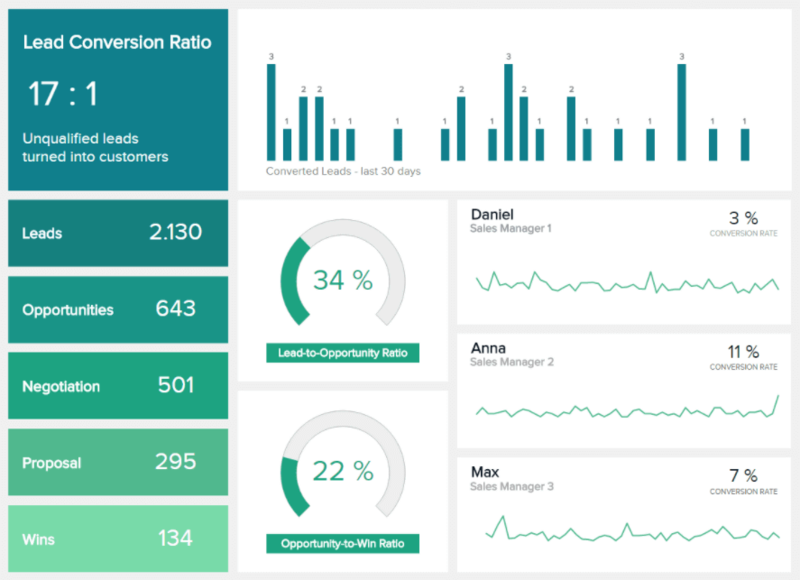 Our additional post on how to make a dashboard and take your decision-making to the next level offers a wealth of information on crafting, developing, and presenting your company’s KPI reports. To illustrate the power of KPI reporting, here are four hand-picked KPI reports examples that are specific to three of the most critical areas of any modern business: financial, management, and sales. Profit and loss are the two most essential factors in any organization’s bottom line. This particular financial KPI dashboard provides a digestible overview of a business’s income statement from revenue to net profit, fortified with appropriate performance ratios. 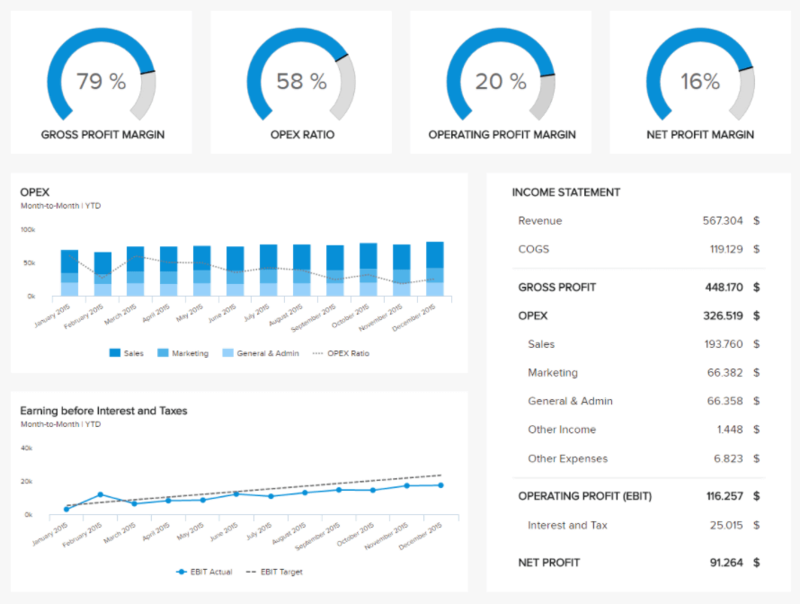 The financial loss and profit dashboard hones in on gross profit margin, OPEX ratio, operating profit margin, and net profit margin, offering a host of bespoke information at your fingertips. By monitoring this KPI report on a consistent basis, you’ll gain a panoramic insight into your business’s overall financial performance and be able to take measures in improving areas you deem to be weak while also capitalizing on areas of strength – essential metrics for any business looking to grow their profits over time. This management-centric KPI dashboard focuses specifically on total revenues in addition to customer-based revenues while providing vital insights that will help you set informed sales targets for your organization. Offering visual data on customer acquisition costs, customer lifetime value, and sales target information, you will be able to make intelligent managerial forecasts, spot trends, and understand where you need to improve processes within the business. A priceless KPI tool for those in senior management roles across a range of sectors and industries. In the commercial world, sales cover a broad spectrum and to ensure you meet your targets while cementing growth, collecting the right data is essential. This KPI report example offers an ideal overview of the progress of your sales department, drilling down on sales growth, sales targets, ARPU, CAC, and CLV. By providing a detailed visualization of every aspect of your sales portfolio, this KPI report empowers sales managers to take a full snapshot of their sales operations without losing any data. Here it’s possible to take an overall glance of your sales performance or analyze specific pockets of information to your advantage, increasing metrics like customer lifetime value and average revenue per unit as a result. One of the best ways to grow your business is by increasing your conversion rates. Of course, there are a number of stages to closing a sale, from gaining and nurturing leads to prompting a conversion – and this particular KPI dashboard allows you to look at each critical stage of the process in detail. Through a series of comprehensive insights and lead-based data, the last of our KPI reports examples will empower you to streamline your sales processes, enhance your sales strategy, and increase your all-important conversion rates as a result. How To Create A KPI Report? Define with various stakeholders your strategic business goals. Pick a couple of indicators that will track and assess the performance of each goal. Stick to the most critical ones. 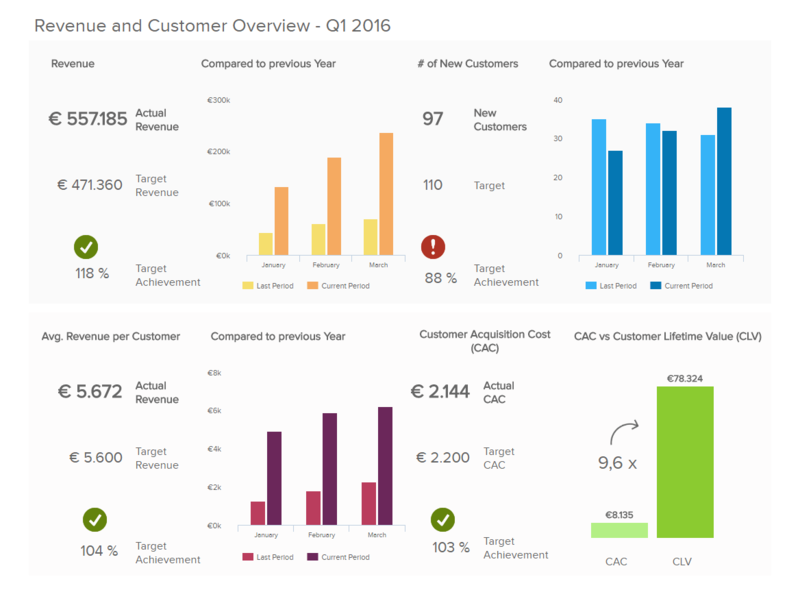 Set up a KPI report where you can visualize them all at once with an online dashboard tool. Don’t get confused in the types of data visualization you choose to represent your KPIs. Get creative and have fun building your KPI reports! It’s clear that KPI reports not only offer a wealth of insights into critical areas of any business, provide the tools to set viable goals, work towards worthwhile benchmarks, and leverage invaluable information to your advantage. But by presenting this information in a logical, visually engaging format, they also provide a long-term solution for organizational improvement and growth. 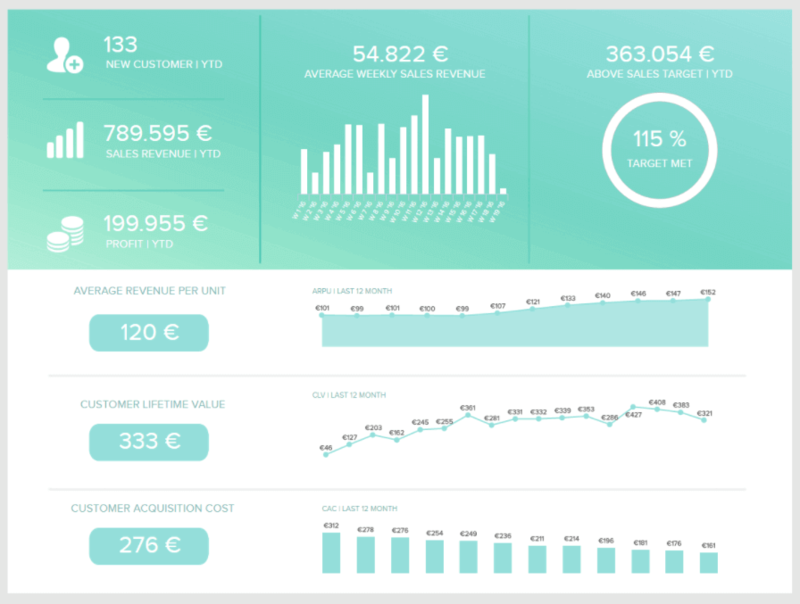 To find out more about common KPI reports examples dedicated to disciplines from management to marketing, you can take a look at our business dashboards examples and templates. To benefit from all that an online dashboard software can bring, have a go at our 14-day free trial!